Last spring, Cam Miller spent his spring break on a "Pay It Forward" bus trip with some of his University of St. Thomas classmates, doing service projects in several different cities. Shortly afterward, he began complaining of back pain, then shortness of breath. His mother, Mary Miller, a nurse at Mayo Clinic's Rochester campus for more than 30 years, initially worried he might have a blood clot from sitting for so long on the bus. A trip to the Emergency Department ruled out that possibility. But over the next few weeks, the pain continued. So the Millers made another trip to the ER, where they would eventually learn the reason for Cam's pain. He had acute lymphocytic leukemia. "Almost overnight, he went from a healthy young man to the challenge of his life," says Mary, who suddenly found herself in a new role as well: the family member of a patient. "There's a lot of worry, a lot of fear on the other side of the bedside," she tells us. But as Mary, Cam and the rest of the Miller family soon discovered, there's also a world of grace and support there. Friends, family and co-workers have "provided us with the strength we needed to remain positive and to carry on," Mary tells us. "You can't get through something like this without other people's help." Much of that help came from Mary's colleagues in Orthopedics/Plastic Surgery. They covered her shifts when she needed to be with Cam, donated money and meals to the family, and offered rides, hugs and prayers. Amy Storsveen, the nurse manager of Mary's unit, says the group has a long tradition of "supporting each other" both at work and outside of work. "We all have busy lives, but when someone needs us, we are not afraid to drop everything and lift them up," she says, adding that she's proud of and "honored to be a member of this team." 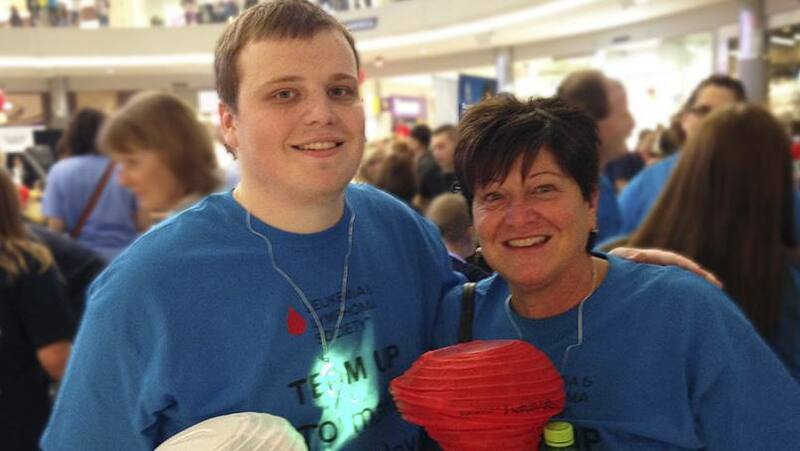 In October, members of that team joined the Miller family at the Light the Night Walk at the Mall of America, to raise awareness and funds for research to find cures for blood cancers, including acute lymphocytic leukemia. The team raised $3,200 — as well as the spirits of the Miller family. "It's been great to get so much support from my mom's co-workers," Cam says. "When you're first diagnosed, it feels like the end of the world. You feel alone. But then you realize that cancer touches so many people. It's great the way people have reached out." Cam will soon finish up his first phase of treatment, then begin a maintenance chemotherapy program that will last another two years or so. He's kept up with his coursework, and hopes to return to Mayo Clinic after graduation — as an employee this time. "My end goal is to do lab work at Mayo," he says. His mother has no doubt his cancer journey will help him wherever his path may lead. "I really believe that kicking cancer is something Cam may have had to do to help him prepare for a life filled with greatness," she says. We think it would be great if you'd leave a comment below. Then, you can use the social media tools to share this story with others.